Anti-inflammatory enzyme produced by the Serratia bacteria. Helps reduce pain and inhibit damaged tissue factors. Generating interest for the treatment of pharyngitis and sinusitis. Serratia peptidase, or serrapeptase, is a proteolytic enzyme produced by the Serratia bacteria that lives in the intestines of silkworms. Serrapeptase has been used successfully for almost 40 years in Europe and Asia to treat pain, inflammation, trauma-induced swelling and excessive mucous secretion. ¤ It induces fibrinolytic, anti-inflammatory and anti-oedema effects in many tissues; its anti-inflammatory effects are superior to those of other proteolytic enzymes. Serrapeptase works by fragmenting fibrinous aggregates, reducing the viscosity of exudates and by inhibiting the release of inflammatory mediators, thus facilitating drainage of these inflammatory response products thereby promoting the process of tissue repair. ¤ It is particularly effective for relieving chronic ear, nose and throat (ENT) inflammation, producing significant reductions in pain severity, quantity and purulence of secretions, difficulty in swallowing, dysphonia and nasal obstruction. Studies have highlighted its beneficial effects in normalising broncho-pulmonary secretions (mucous). ¤ It helps reduce toxins in the intestine as well as reactions to foreign bodies. ¤ It boosts antibiotic activity and tackles bacterial resistance by inhibiting formation of their natural protective biofilm. ¤ In addition, because serrapeptase is able to digest dead tissue - indeed, this is how it releases the silkworm from its cocoon - it can be used to restrict arterial obstruction (atheromatous plaques) and facilitate circulation. Hans Neiper, the world-renowned German doctor and scientist, has reported significant improvements from serrapeptase treatment in the circulation of a number of patients with previously compressed arteries. 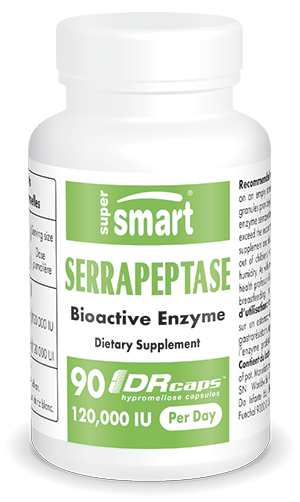 ¤ As with all enzymes, serrapeptase is sensitive to stomach acids. To improve its efficacy and bioavailability, new technology has enabled it to be produced in a gastroresistant form, DR Caps, which release their content only in the small intestine. Adults. Take one capsule twice a day on an empty stomach. Each DR Caps™ contains 30 mg of serrapeptase.